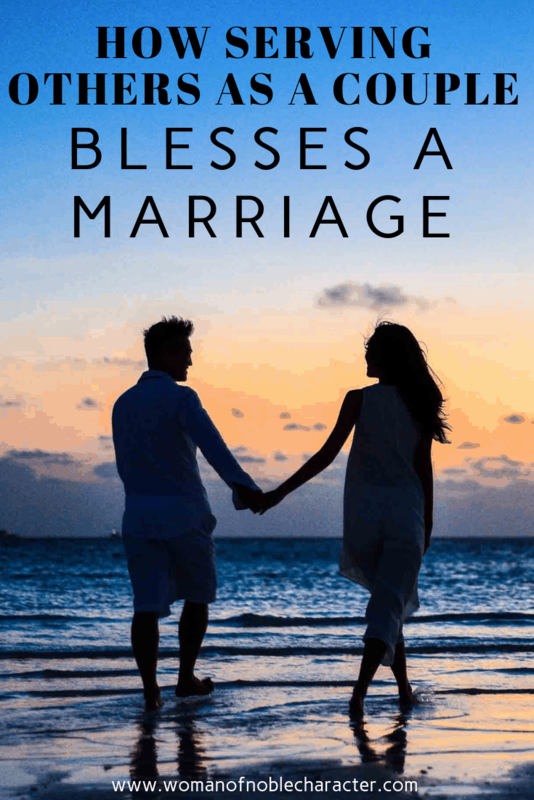 In my book, The God Centered Marriage: Honoring Him Through Your Marriage, I talk about a lot of things that can bless a marriage or hurt a marriage. One of the best ways to strengthen a marriage is to share joint experiences. What better way to share joint experiences is there than to share experiences that bless others and show God’s love through you? By serving others together, you bless not just those around you, but your marriage, as well. The apostle Paul wrote: “Do nothing out of selfish ambition or vain conceit, but in humility consider others better than yourselves. Each of you should look not only to your own interests, but also to the interests of others” (Philippians 2:3-4). This passage reminds us that we are to have a servant’s heart and to look to the interests of others. When couples serve others together, they experience peace, greater love, contentment and a deeper bond that strengthens their marriage. As humans, we are selfish by nature so serving doesn’t come natural to many of us. 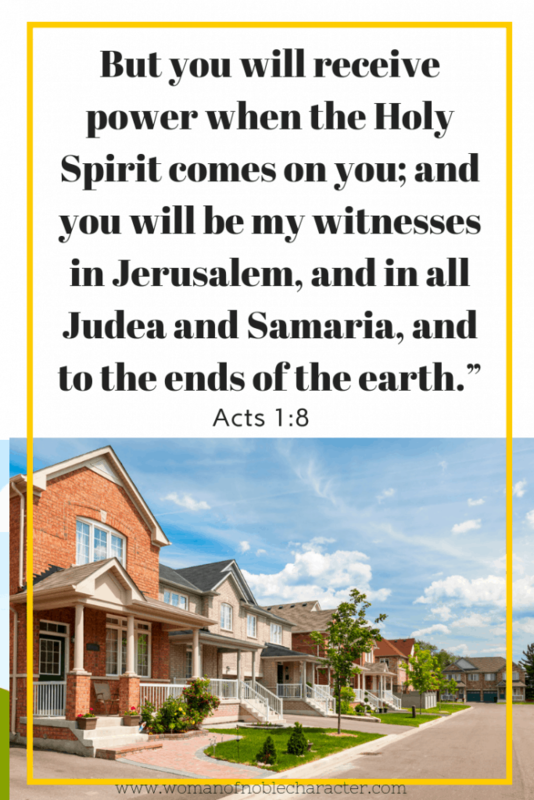 To relate that to our lives today, we can consider our “Jerusalem” to be our local church, “Judea” as our neighborhood, “Samaria” as our community at large and “to the ends of the world” is our call to support and serve missionary efforts across the globe. When we frame it this way, we see that fulfilling the Great Commission is achievable. 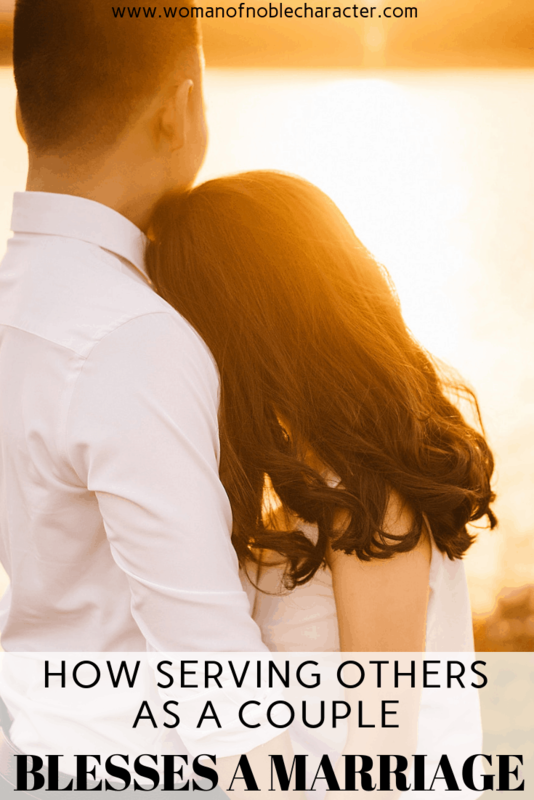 Serving others as a couple has benefits that go beyond peace, bonding, and even greater love. There’s a special, particularly sweet intimacy that comes with working together on a service project or serving as a couple to those in need. Couples who answer God’s call to serve others experience an added closeness, that experiential serving and sharing. They also gain memories and experience special moments when serving together. In addition, serving others together in ministry opportunities – at church, your neighborhood, community or the larger world – can also help you to deepen your faith as a couple. Working alongside your spouse to fulfill the Great Commission, in any capacity that you decide as a couple, deepens your spiritual intimacy in ways few other things can. 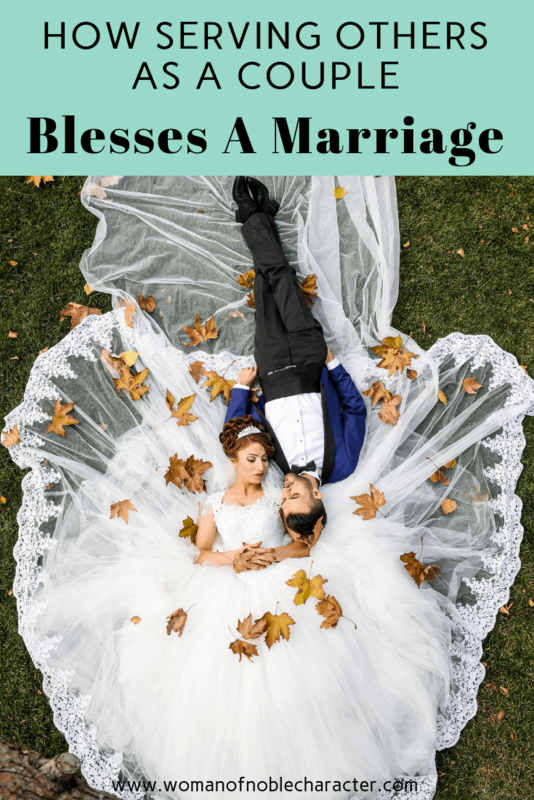 Serving and being the hands and feet of Jesus has incredible blessings to those around you and to your marriage. And, while growing your marriage is a beautiful, God-honoring thing to do, it’s not really about you, is it? It’s about those who you touch. The needy, the hurting, the poor in things and spirit. Serving others strengthens your home church, your neighborhood, your community and the world at large. It can help to transform lives – the lives of those you serve and yours – and brings people together. Below, you will find ideas on where to serve as a couple. 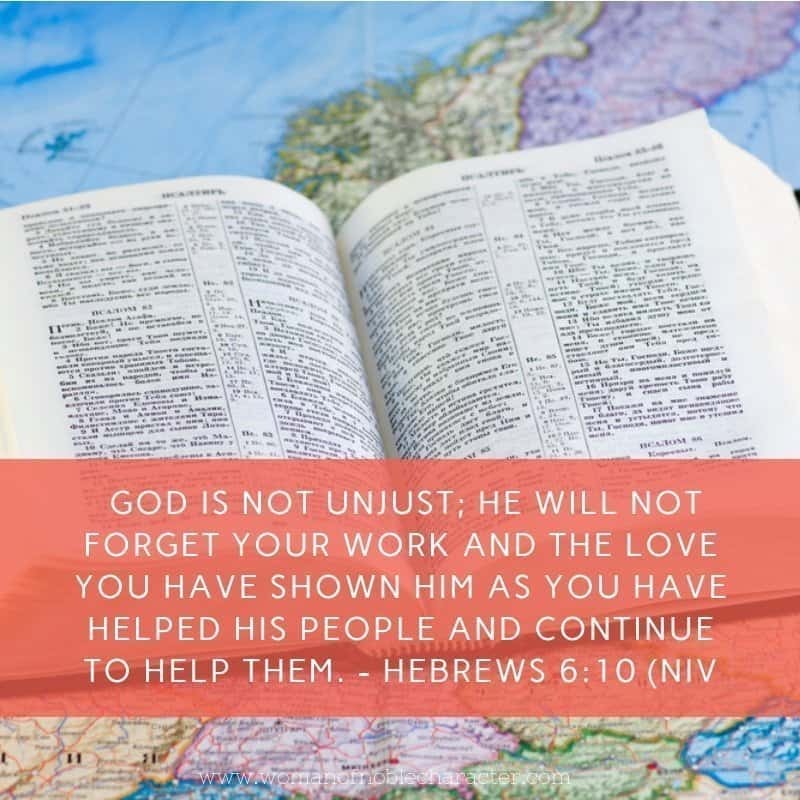 As you look through them and prayerfully decide where you and your spouse will serve, remember that serving is not something to check off of a list or something to use to compare your spiritual measure. It is about sharing the love of Jesus to others. When discussing with your spouse where and how you can be serving others together, prayerfully consider each other’s spiritual gifts. Each of you may be equipped differently. Find the commonalities so that you both serve in ways that God has endowed you to. Most churches have many different ways to serve others. You can serve within the walls of your church or with your church in the community. My husband I serve together as Ushers 2-3 times per month. It’s a great way to get to know others at church, welcome guests and serve and love others. Teach Sunday school together or volunteer in the nursery. Mentor a young couple or new parents. Serve as church greeters, perhaps together with your children. (If you church allows this) Your kids will learn how to greet others, and those who are greeted love seeing them. Offer to baby-sit for couples in your church. Parents with younger children are often in desperate need of “alone time” for shopping or a date night. Teach younger couples about once-a-month cooking, organizing or other practical skills. Don’t forget; men like to cook, too. If you’re mechanical or a handyman, help a single mom or older couple with car maintenance or a fix-it project. My husband is a plumber and he has, on several occasions, done repairs for the elderly or single mothers. Although I didn’t help with the repair, it did give us the opportunity to pray, as a couple, for those he helped. Think about ways that you can work together to love on your neighbors. Talk about how to meet them, get to know them, and build a relationship with them so you can discover their needs. Then pray together and discuss ways you can meet those needs with God’s help. As you serve other together, especially your neighbors, you will show the love of God and be His useful instrument He brought you together to be. Host a Christmas open house. Some bagged or pre-prepared treats and a beverage are all you need. Shovel a neighbor’s sidewalk or driveway. Bring in the neighbors’ garbage cans for them. There are so many in each community that are in need, hurting, lonely, or experiencing hard times in other ways. Be the hands and feet of Jesus to show love to those in your community. This past semester, we were also part of a small group focused on serving the community. The group prayed over new home being built, visited a funeral home to learn more about serving grieving families and visited a prison to minister to the incarcerated. As mentioned above, your church may have opportunities for you to be serving others together in your community, but you don’t need to rely on just what opportunities exist at your church. Volunteer as Salvation Army bell ringers. Adopt a college student or foreign exchange student. Have him over for a meal, even if it’s just once a month. Schedule a regular “date night” to serve together in a local nursing home (singing, doing crafts, teaching a Bible study, etc. ), or visit kids in the hospital. Few of us are able to serve as missionaries, especially in other parts of the world, but you can support missionaries in so many ways and that support, when done as a couple, multiplies the benefits for the missionaries and your marriage. Make a year-end donation. Not only is a donation tax deductible, it is a physical symbol of your support. Send a Christmas email, a gift certificate or care package. Offer to become a marriage mentor or begin a Bible study with them via Skype. Become a prayer partner and let them know you’re praying for them regularly. Email them at least once a month, just to let them know you’re thinking of them. Send e-cards to commemorate birthdays, anniversaries and other occasions. Some missionaries have very few folks around them to celebrate special events; be one of those few. My husband, Mike and I continually grow closer as we are serving together as a couple. There’s something so special, even almost intimate, about serving those in need. It helps us to connect, slows us down and reminds us of all of the blessings that He has given us. 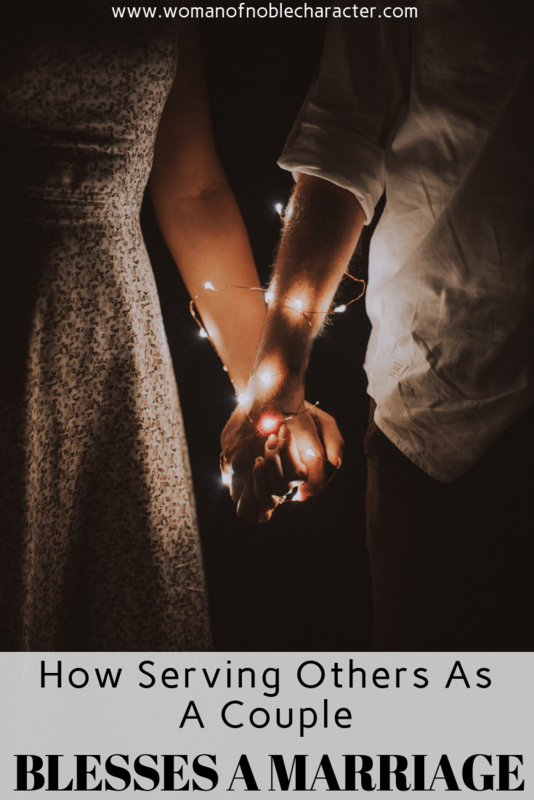 Read the above blog post together and discuss how it applies to your marriage. Discuss how the two of you currently serve God as a couple. Are there other ways you have thought about serving the Lord as a couple? If you have not discussed it with your spouse, do that now. 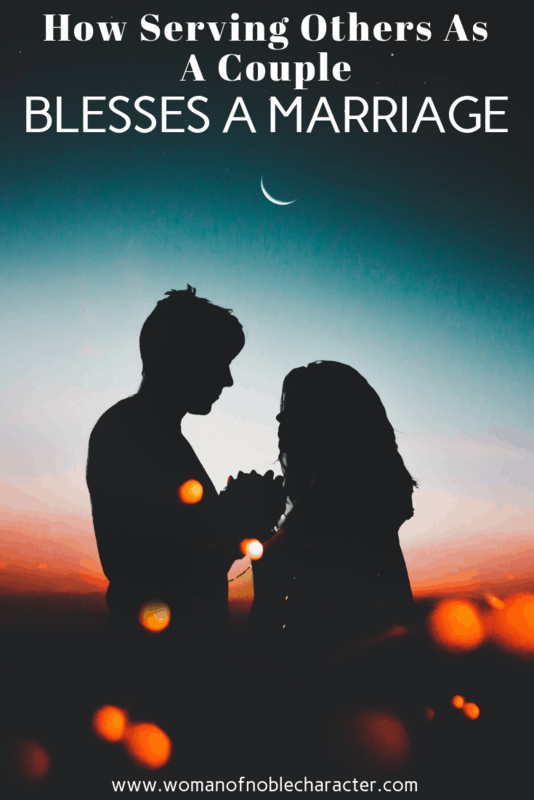 Pray together asking God to help you as you serve him as a married couple. Ask him to reveal to you other opportunities He may want for you to serve Him together. As you look into 2019 and consider your opportunities for serving others together, spend some time as a couple planning your goals and dreams with the free couple’s planning workbook.